My seventh trip to India happened this past September. Every time I come here, I don’t know what to expect. For one thing, I’m different. It’s a different me that arrives each time. For another, India is different. India is changing, and probably faster than any society on earth. Above, staring out at the Ladakh immensity from Thiksey Monastery chortens. When I first started travelling in India nine years ago, the Delhi airport was basically a big, old shed and women almost universally wore swathes of fabric, in the Indian style. Now the Delhi airport is new and glitzy and could be in Houston; and many young women here wear jeans and t-shirts. In my own journey as an India traveller, I too am changing. When I first travelled in here, I was completely mesmerized by the novelty, and all the things about India that foreigners usually cite (colour, chaos, crowds, spirituality, historic sites, etc). I had a long and fruitful honeymoon stage. India was my muse, and I wrote thousands of words. But like all love affairs, it has become complicated. 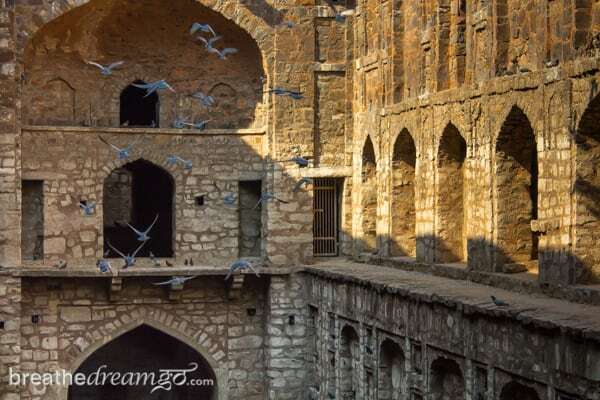 Ugrasen ki Baoli is an ancient stepwell in the heart of Delhi. Very evocative place. I am still besotted by what I see as the essence of the experience of travel in India — radical transformation. India will change you, if you let it. It will challenge you on just about every level and “broaden your horizons,” as my Mom used to say. It may also give you a renewed sense of faith in the universe, in the mysterious workings of the cosmos and the underlying truth that connects us all. Sometimes, when you are completely frustrated, exhausted, disoriented and sensory-overloaded, India will surprise you with a moment. The veil draws back, a woman smiles, a man hands you a flower, the sky turns pink, incense and temple bells waft by on the breeze. Everything is okay, and it always was, and always will be. These are the “magic moments,” and what we Indophiles live for. But they don’t come easy. On this trip, it took me quite a long time to recover from jet lag, and a much longer time to recover from culture lag. I had to re-adjust to being in India, and I was rusty. I had to re-remember so many things, from shutting my mouth tight in the shower to negotiating for autorickshaw rides. But more than that, I had to get in contact with the Indian version of me. I am a different person in India than I am in Canada — I have to be to live and travel here with any ease. From my perspective, the Indian worldview is much more fluid and present-centred; more relationship oriented and less achievement driven; much less controlling and and more accepting, it accords a much larger role to the presence of the unseen. 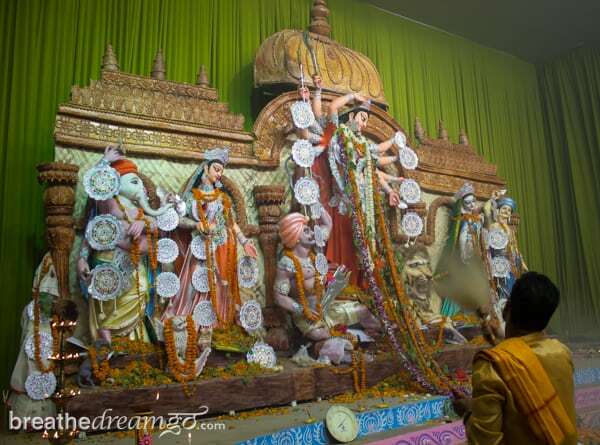 “God knows best,” I have heard people in India say many, many times. My travels in India on this trip has had plenty of highs and lows, which is par for the course. But I got off to a good start. I was given a business class upgrade from Jet Airways, and a coveted single seat. This is a great configuration for the solo traveller: when you press the button to make your seat a bed, you are alone, with no one sleeping beside you. Being able to lie down and sleep really makes the very long journey from Canada (almost 24 hours door-to-door) much more bearable. My next high happened when I arrived at the shiny new Indira Gandhi International airport in Delhi. While flying, I was thinking a lot, for some reason, about my first trip to India, back in 2005, and how anxious I felt about all the unknowns facing me. I remember peering out the window into the midnight blackness and realizing I had no idea what to expect from India and from my impending six-month journey. When I arrived in India for the first time, on December 5, 2005, an old acquaintance was waiting for me at the airport. I hadn’t seen Ajay in 13 or 14 years, could barely remember what he looked like. But there he was, and he drove me back to his family home in South Delhi, and he and his family became a very important part of that trip — and my life, from then till now. This time, by chance, Ajay was in India ahead of me, and waiting for me as I arrived for the seventh time. When I walked out, with my luggage, and saw him standing at the exit, and smelled the sultry, acrid air of Delhi, I had a full-circle feeling. Life has seemed so chaotic and challenging in the years since I first landed in India, I didn’t expect this lovely, satisfying feeling; as if everything was unfolding perfectly, and I was exactly where I was supposed to be. It was a gift, this feeling, and it hasn’t left me. It feels like some era ended when I landed this time, on September 2, and a new era has begun. My third high arrived shortly thereafter. One of my readers put me in touch with Atul and Sheetal of Thikana in Gulmohar Park, South Delhi and they very kindly hosted me for my first week in Delhi. Thikana is one of the leading guest houses of Delhi, a place I had long wanted to visit, and I wasn’t disappointed. Regular readers will know that I love Delhi, it’s my home-away-from home and my favourite city in India. One of the many lovely public spaces at Thikana guest house in South Delhi. I can now absolutely recommend Thikana to readers. It’s exquisitely decorated in high Indian style, the rooms are comfortable and modern, the location is good (closer to a metro station would make it ideal) in one the most upscale colonies of South Delhi and best of all is Sheetal and Atul, the hosts and owners. They, and their staff, go out of their way to make people feel at home and comfortable, and to answer questions and help with anything and everything, from laundry to bank machines to restaurant recommendations. Plus, they’re fun. On my second or third night, Atul invited me to have drinks on their roof top terrace, a great place to hang out. Two other guests joined, I put my duty-free bottle of Bombay Sapphire on the table, and we enjoyed the very warm Delhi evening, under a waxing moon. Outside Leh, surrounded by Himalayan mountains, at sunset. My first low was jet leg. I cannot exaggerate how bad the jet lag is, for me anyway, that results from travelling across half the world. I was a wreck, and I made the mistake of not giving myself enough time to recover. I ran around getting a SIM card, an Internet dongle, and running errands, and then gave a presentation at the Indian Association of Tour Operators convention only three days after landing. My second low was the Kashmir floods. I was scheduled to fly to Kashmir on September 6, but the floods were worsening and the situation was growing dire. My own disappointment about not getting to Kashmir was dwarfed of course by the humanitarian crisis. The floods in Srinagar Valley, exactly where I had hoped to go, were the worst in 60 years. The trip to Kashmir and Ladakh was hosted and arranged by India Tourism, so I met with them in Delhi and rearranged my itinerary. Luckily, a seat was available to fly directly to Ladakh, and away I went, to the top of the world. 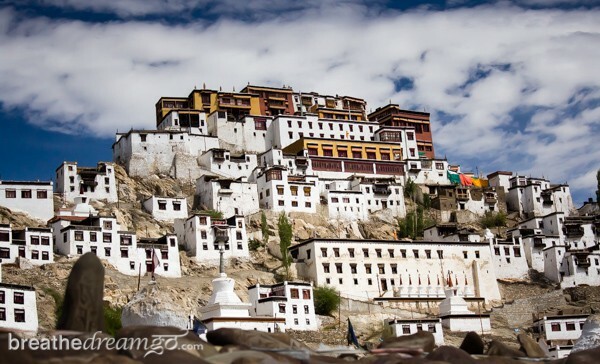 Thiksey Monastery is one of the treasures of Ladakh. If you look at a map of India, Ladakh is right at the top, the part that sticks up and is surrounded by Pakistan, China and several of the “stan” countries. Culturally and geographically, it is tied to Tibet. Like Tibet, you feel you are on the roof of the world, and about half the population are Tibetan Buddhists (most of the rest are Shia Muslims). The Himalayan mountain range runs through Ladakh, and the altitude of the capital city, Leh, is 3,500 metres — going up to 4,500 metres if you cross passes outside of Leh. This means, without proper acclimatization, you can develop acute mountain sickness (altitude sickness). Some people are more sensitive to AMS than others — and I, unfortunately, am one of those very sensitive people. I was sick with AMS in Colorado and Bhutan, so I took every precaution possible for Leh. Ideally, you should move slowly up to these altitudes. The sickness usually occurs when people fly to Ladakh (like I did). Seriously, do not underestimate AMS. It kills tourists every year, usually people who land and start trekking without adjusting properly first. 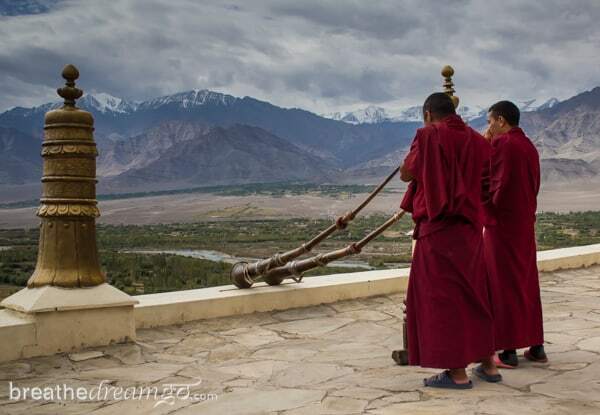 Research and plan your trip to Ladakh very carefully. Altitude sickness is one danger, and another is weather. It gets very cold and very snowy in Ladakh early — sometimes in late September — and passes close, airports are shut. Tourists sometimes get trapped there for days and weeks. Summer is the ideal time to go, of course. It’s warm — up to 30 C. — and the roads are clear. 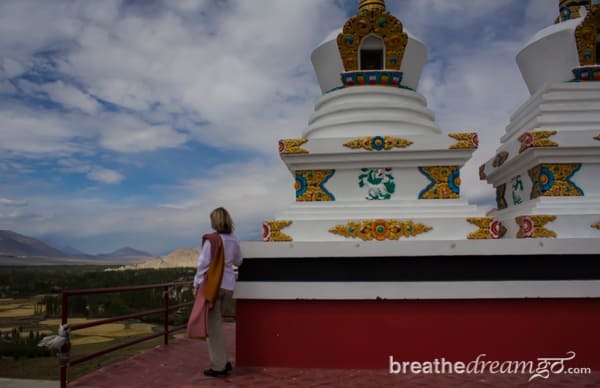 When I was there, I was based in Leh for about five days, and just made day trips into the countryside to see monasteries, chortens, palaces and the stark and beautiful landscape. Ladakh is a high altitude desert. 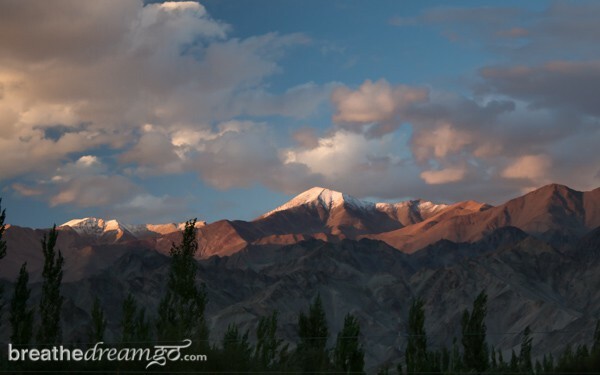 The Himalaya mountains create a “rain shadow,” which prevents monsoon clouds from reaching Ladakh and releasing rain. Many times in Ladakh, I felt I was in Tibet, especially of course when visiting Tibetan Buddhist monasteries. In fact, Ladakh and Tibet are very closely tied both culturally and geographically, and in former times, politically also. Though I have not been to Tibet in China, I imagine that Tibetan culture is better preserved in Ladakh. After I returned from Ladakh, I relaxed in Delhi for a few days before heading down to Kerala for the Kerala Travel Mart and a wonderful week at Kaiya House in Varkala, Kerala. Kerala is one of my favourite states in India. 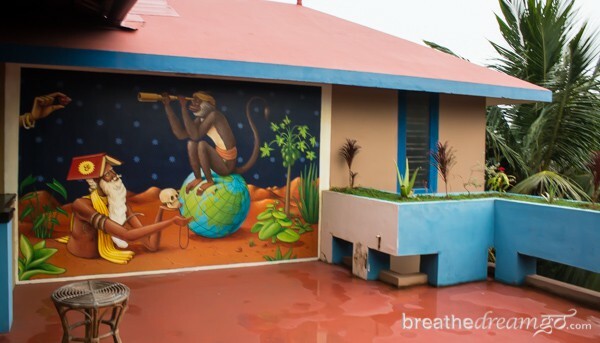 Stunning painting on the lovely roof top lounge of Kaiya House, Varkala, Kerala. 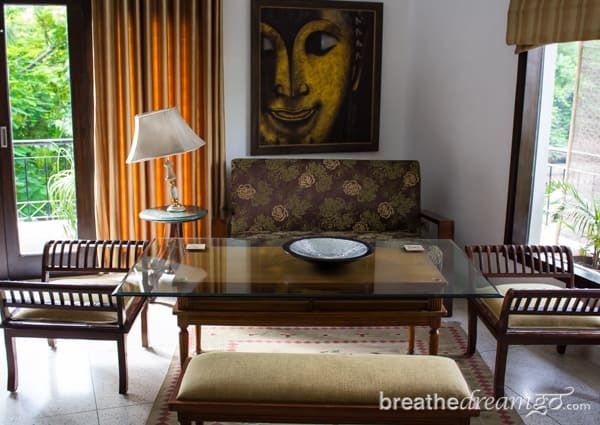 Kaiya House is one of those special places I look for in India — places that hit that sweet spot between basic and luxurious; that are run by caring owners; and that have a special ambience that inspires creativity. Kaiya House, the number 1 guest house in Varkala according to TripAdvisor, does indeed hit the spot. The “secret sauce” at Kaiya House is the owner/ manager Debra, an energetic and detail-oriented American transplant. I have never experienced a more helpful and caring guest house owner. Debra makes sure all your needs are met and that you receive a thorough orientation. After a week of relaxing and working in Varkala, I headed back up north to get ready for the Mirabai Expedition. More on all these trips later, the Ladakh stories, and of course Mirabai Expedition … as soon as I stop moving. Excellent piece; it resonated with me and all I have ever written on India where I was born and grew up. I too return annually for six or seven weeks and was there earlier this year and now as I prepare for World Travel Market next week I am planning our seven week trip for very early in 2015. India warms your heart….if you let her. Agreed. India has a magical way about her Aline.